Navy & Red Class A Jacket | J. Higgins, Ltd. Please note: We accept departmental, municipal, state and federal purchase orders. Once submitted and approved, you can order online using our 30 day net billing option. A very versatile jacket for Police Departments. Our Class A Honor Guard jacket comes with metallic silver trim collars and epaulettes, two front pockets, two inside pockets, two belt hooks and easy-to-remove buttons. Standard buttons are our chrome thistle buttons, but you can even send us your department buttons and we'll put them on. You can also order without buttons and put yours on using our sleeve access for easy mounting. This doublet has become very popular mainly due to its attractive price and clean look. We make these jackets using a wool blend of 55/45 similar to traditional Honor Guard jackets. Available in stock sizes 42 to 58 in regular (25" sleeve) and long (26.5" sleeve) sizes and exchangeable if the first size doesn't fit. We can even quote you a price with honor guard pants too if you are interested. Waist belt, kilt and sporran sold separately. We want to introduce you to Drum Major Jason Paguio. Jason is a 5 time World Drum Major Champion. 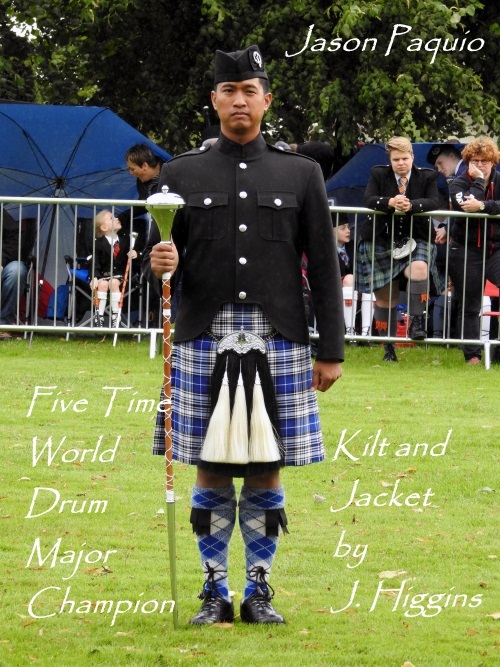 Here he is at the 2016 World Championship wearing his J. Higgins Napier kilt and Class A Honor Guard jacket. We were truly honored to tailor Jason's kilt and jacket. Jason tells us his outfit was the only one with zero dress fault deductions in the contest. Well done Jason! Congratulations on your 2nd place in 2016! Check out our video below for measuring instructions.